The usual refresher course – Part 1, Part 2, Part 3, Part 4. Incredibly, adidas produced nine different designs for the countries it supplied at the 1990 World Cup in Italy, so we have split the offerings into two different posts, with four here (covering seven countries) and the others to follow. Ireland reached the last eight by beating Romania in a penalty shootout, with Packie Bonner’s save from Daniel Timofte allowing David O’Leary to score the winner. Bonner was clad in an unfamiliar grey that day as his normal shirt – a plain yellow, similar to his one at Euro 88 but featuring the same fabric pattern as the outfield shirt – clashed with the Romanians. The grey differed in that there was no pattern and the three stripes only went from shoulder to cuff. The slightly mismatching socks meant that each element of the kits had three stripes in differing colours. The only colour-scheme which was repeated was used by Sweden’s Thomas Ravelli and Thomas N’Kono of Cameroon, who was also seen in blue and grey. Like Preud’homme’s, Ravelli’s shirt had an extra adidas trefoil. The remaining two examples worn in Italy (we specify ‘worn’ as there was a black and yellow Yugoslavia shirt but their goalkeeper Tomislav Ivković preferred to play in Uhlsport shirts with the adidas logo affixed) were by players who didn’t start the competition as first-choice. While Rinat Dasayev of the USSR wore one of the styles featured in Part 6, when he was dropped, his replacement Aleksandr Uvarov opted for a black and grey edition of this design. Nery Pumpido, a veteran of Argentina’s 1986 win, had worn a unique style in the opening loss to Cameroon and then broke his leg in their game against the Soviet Union. His purple and shirt had a crest but oddly substitute Sergio Goycochea’s didn’t. 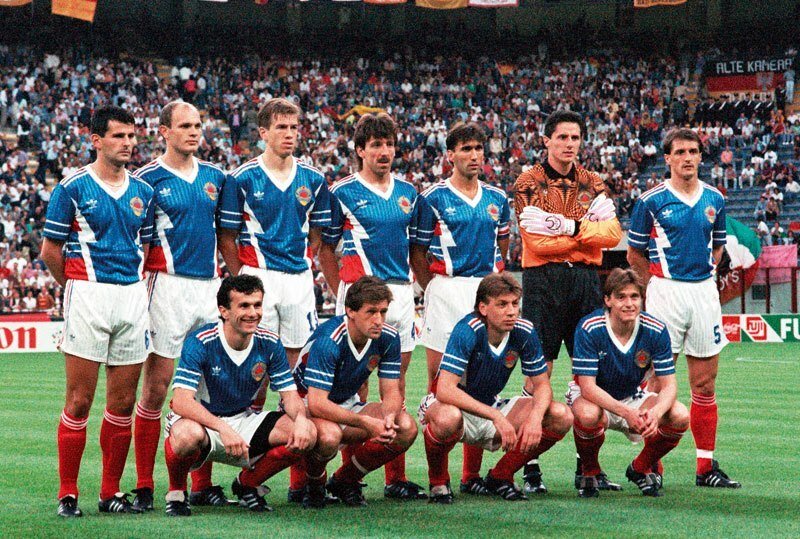 Come the knockout stages – all the way through the final, encompassing penalty-shootout heroics against Italy in the semis – Goycochea would have a new look, not unlike a computer game (he wore the same socks as his team-mates, so the blue were used in the final against West Germany). Also with a look sported by nobody else was the Netherlands’ Hans van Breukelen, whose shirts featured a kind of checkered look and an anachronistic large flappy collar, while the white shorts and socks set him apart from practically everyone else. Though the clear part in the middle might point towards consideration for a sponsor’s logo if used by a club team, we have no evidence of the design being worn by anyone else. Ivkovic not always wore the Uhlsport shirts in Italia 90, in the quarterfinals, he wore a yellow and black kit similar to the one worn by the keepers Dasaev (USSR), Meola (United States) and Stejskal (Czechoslovakia). About Holland GK Shirt design i remember that he wore it when he played for PSV, and this design was also worn by the keeper Juan Carlos Ablanedo when he played for Sporting Gijon (Spain) in 1992. Cheers Lucas, your insights always valuable. Oddly when Higuita wore the ‘Space Invaders’ jersey, the pattern was upside-down, I must add that to next instalment! I’ve reached the promised land of football jersey nerdvana. Really enjoying the site. Appreciate all the hard work gone into the research. Just a point of note( not a correction mind you!) on Packie’s grey shirt worn against Romania. I could never be sure if the match worn one had the boomerang patterns. But the replica versions certainly did. Cheers Ray! It’s funny – I only heard recently that replicas of the grey even existed, apparently they had the black adidas stripes on the shoulders too, unlike Packie’s! Yeah, I reckon it was a financial decision because all the kids( myself included) were Packie crazy after Genoa! The replica had stripes all the way down and Opel was in white. Don’t think it was ever worn in a full international again though. No, and the following kit, 92-94, didn’t cause any clash either! Does yours have a number on the back? I recall a lot of the yellow shirts being sold with it on. Ooh there’s a question now! I haven’t had the jersey in my possession for a long time but if I was to guess I’d say there was actually a black number 1 on the back rather than the match worn white.